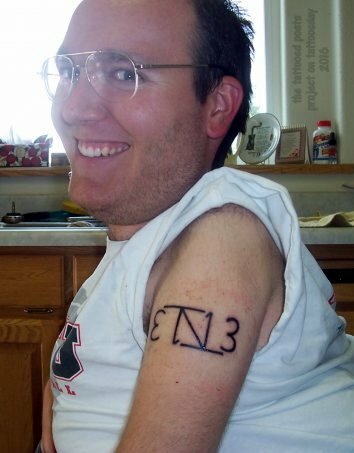 Travis explains that the TN13 tattoo "combines the T & N, moving off the final bar of the N into the 13." "My dad's dad (Papa) used the TN arrangement as his cattle brand, and it just so happens that my initials are TN. I was born on a Friday the 13th, so if anyone has rights to having that number on their body, it is me! After reading Angels & Demons by Dan Brown, the prequel to The Da Vinci Code, I was struck with the way the Illuminati would write the same word legibly forward and up right as well as upside down and backwards at the same time [ambigrams]. This made me set to work during the more boring college classes I took at designing my tattoo. Gary Brandon at Body Language Tattoo in Cheney, WA put the design on me exactly as I requested, and it has brought lots of commentary since being placed there!" People assume a lot of things about a guy in a wheelchair (spinal muscular atrophy, a form of muscular dystrophy), that particular tattoo goes against several of those assumptions!" Travis chose to share the following poem, which appeared previously in Empty Sink Publishing here. Thanks to Travis for sharing his tattoos and poem with us here on Tattoosday!